“This morning I got up at five, opened my tablet, and saw a “HAPPY BIRHDAY” message which made me very happy…” she added. Moreover, from the podium she thanked everyone involved with arranging this special surprise for her. “Lastly, I am very appreciated with all presents / presentation today, God blessing you Wishing you all and guide you for the better life, and to be successful…Thank you enjoy eating ice-cream ! !” said Dr Piyada. 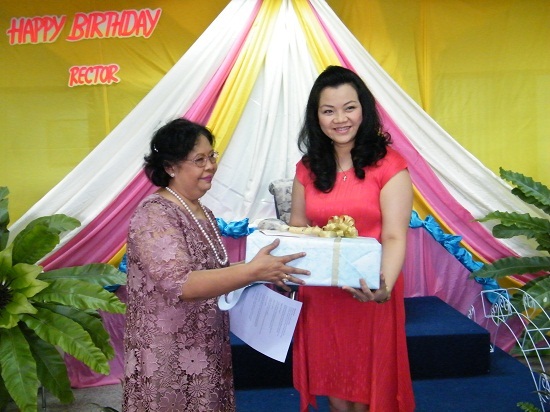 Born in Bangkok on July 18, 1972, Dr. Piyada Wattanasan is currently the Rector/ President of St Theresa International College. She has more than 22 years of extensive experience working with the STIC in areas related to academic and administrative duties. Beginning her job with the STIC as a teacher in 1990, she was subsequently promoted to Administration Assistant, Executive Director, Finance Director and Course Director before settling into her current position as the Rector/ President in 2001. She earned her Doctorate of Philosophy in Education from Adamson University, Philippines, a Graduate certificate of Advanced Studies in Education Sciences from Katholieke University, Leuven, Belgium as well as a Master’s degree in Business Administration from the University of Bradford, UK, a Bachelor’s degree in Business Administration from Assumption University, Bangkok.